You may remember a post earlier this month in which I had reason to mention Chupa Chups, those lollipops that came into fashion in the United States in the 90s, not-so-coincidentally around the same time as the rise of rave culture, when young people clad in day-glo suddenly had reason to protect themselves from the dangers of jaw-grinding. Spencer directed me to the official site of the Spanish lolly company, with the recommendation to sit through the flash intro. I was not disappointed. 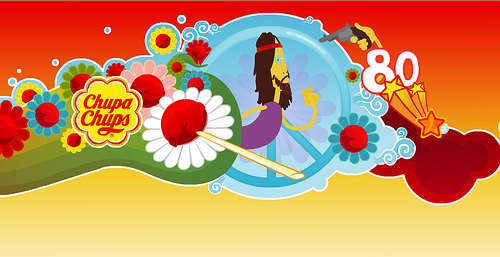 The current Chupa Chups site celebrates the brand’s fiftieth anniversary. 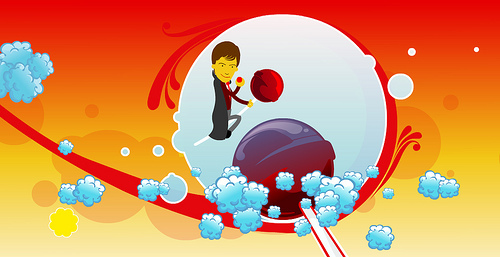 Along with the strange slogan “Fifty years of moving your world” — apparently in and out of your mouth in a rhythmic, sucking motion, it would seem — the site also includes a retrospective of world events, both historical and pop cultural, and all styled with a lollipop theme. It’s aesthetically pleasing for what it is. And here’s a reference to Forrest Gump, racing past a White House inhabited by a giant, dark-haired Bill Clinton, who, notably, is the only politician depicted in a sequence that appears on all of the various language versions of the site. 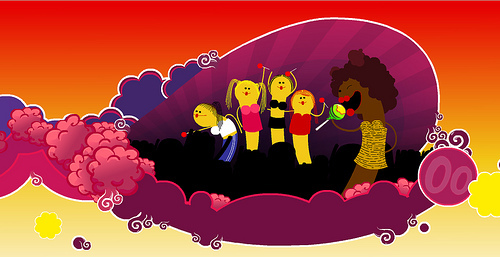 Here are grotesque, finger puppet-like depictions of The Spice Girls, who, if I remember correctly, had some sort of advertising thing going with Chupa Chups for a period. And, just past the DNA helix comprised of lollipops, is something close enough to Harry Potter but unlike him enough that the wrath of J.K. Rowling won’t fall upon Perfetti Van Melle, of which Chupa Chups is a subsidiary. But what easily stand out most in the fifty-year flashback is the transition from the assassination of John Lennon to the introduction of Pac-Man. Yes, that’s right: Some Flash programmer charged with looking at history through the lens of candy saw fit to recall the fact that John Lennon was shot to death. It’s odd and jarring, at least to my eyes. 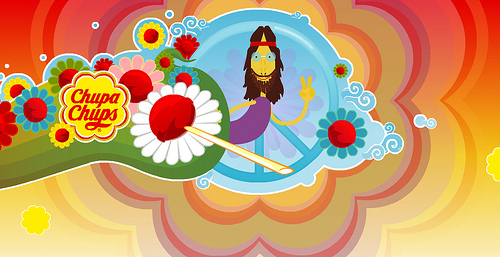 Here, oddly comprising the bulk of the sequence’s notice of the 70s, is the cartoon hippie, looking a lot like a hybrid between a Simpsons character and a South Park character and waving cheerfully in front of a peace sign. He doesn’t necessarily look just like Lennon — the Mick Jagger stand-in bears a closer resemblance — but it could easily be him. I mean, look at those glasses. 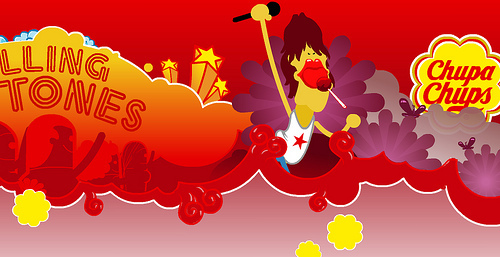 Also, the fact that he’s showing up just at the end of the 70s instead of in the 60s, where a generic hippie would make more sense, makes me think this is indeed Lennon. But what’s that? Oh! There’s a little gun pointing at our pseudo-Lennon! The gun doesn’t fire a bullet — only a “bang” flag. 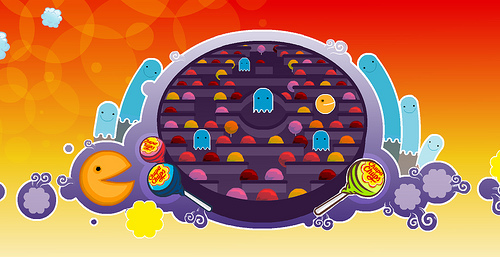 The hippie, however, disappears, to be replaced immediately by a Pac-Man ghost version of him. And then, of course, the next historical landmark we hit is indeed Pac-Man, which actually debuted in Japan a few months before Lennon died. Strange, no? And a little tasteless? I suppose it would have been better had the sequence recalled other downer moments between 1958 and 2008 — and there were a few, I feel — but it just included this one. So, I read only up to the line "with the recommendation to sit through the flash intro. I was not disappointed." And I watched the intro, and it took me till the 80's to figure out that is was going through the decades.....Then I read the rest of your blog and felt like an idiot. Also, I remember these things being pretty huge in middle school, when pop groups began to promote them. It was The Spice Girls who were pushing them, right? Do I remember this correctly? 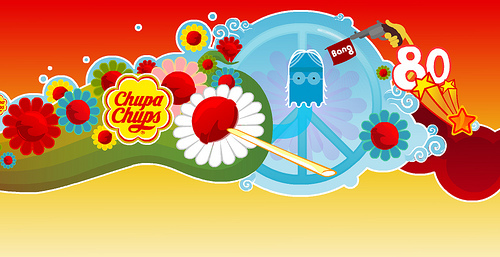 And did you get to the part where they confirm that the Chupa Chups logo was designed by Salvador Dalí??? I actually didn't see that on the site, though I'd read it earlier on the Wikipedia page for Chupa Chups. Very surprising. This blog did a nice job explaining why it might actually be not so surprising.